Progessive peel-serum to target all skin imperfections: blackheads, pores, redness, dark spots and acne scars. his non comedogenic, non acnegenic gel-serum has an ultra-soft feel and lightweight texture with a fresh scent featuring notes of lily and rose. 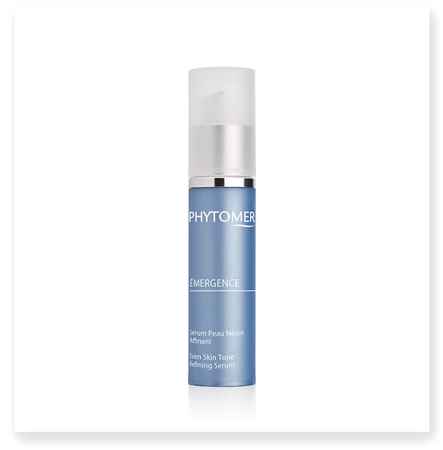 ÉMERGENCE Even Skin Tone Refining Serum can be used as an intensive beauty treatment, or year-round to improve the appearance of blackheads, pores, redness, pigmentation spots or acne scars for a renewed skin result. Apply morning and evening to perfectly cleansed face and neck, avoiding eye contour. Follow with the use of usual facial cream (without rinsing). Warning: this product contains AHA that may increase skin’s sensitivity to the sun, increasing the possibility of a sunburn. Use a sunscreen, wear protective clothing and limit sun exposure while using this product and for a week afterwards. Non-comedogenic. ALPHA-SOFT - a multi-layered gel composed of 3 AHAs (glycolic acid, lactic acid and citric acid), that retextures the skin and erases all imperfections. Marine AHAs (Porphyra-Conchocélis) - 100% natural acid exfoliant obtained from red algae. Eliminates dead skin cells and impurities while respecting the integrity of the skin barrier. *Clinical efficacy on 21 volunteers - twice daily application during 14 days. ** Clinical efficacy on 21 volunteers - Twice daily application during 28 days.